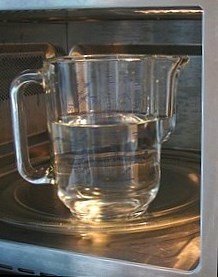 Do you need help boiling water in the microwave? Make sure you know some microwave safety tips beforehand. When preparing tea, the way you boil water is quite important and safety is the key! 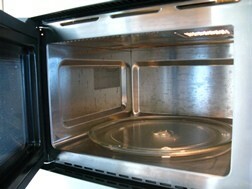 A microwave oven can be quite useful for boiling small amounts of water, particularly if you are in a hurry. Let's make the most of your microwave oven! Choose your tea, prepare your teacup or mug and follow these simple steps to heat the water you need. First establish the quantity of boiling water you will need. 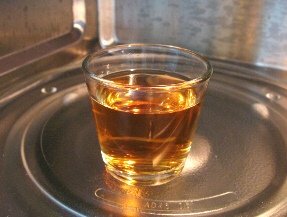 Measure that amount and pour the water into a microwave-safe container. Next put that same container in the microwave oven and set it on High. Now heat the water until it boils. It should take 4 minutes for one cup; six minutes for two cups and ten minutes for four cups. Heating time will depend your microwave potency. Please use pot holders or regular oven mitts when removing the hot container from the oven. Quite easy, isn't it? Now you can go ahead a brew your tea. However simple it may seem, you should always be careful when boiling water no matter what means you decide to use. And using a microwave oven calls for a few extra precautions that you might otherwise overlook when using a kettle. Do not heat water or any other liquid for longer than necessary. Wait a minute or two before removing the container from the microwave. This will allow the liquid to cool, avoiding a possible explosion if it is too hot. Be sure to always use pot holders or oven mitts when removing the hot container. Be cautious when using spoons, teabags or powders, because it may cause an eruption if the water is overheated. This may burn you seriously. Avoid using containers with a smooth and unscratched surface. Keep your face and body away from the hot container. Put a wooden stick in the container while boiling the water. This will reduce the risk of getting burnt (if the water is superheated), because it will diffused the energy accumulated. So if you choose to boil your tea water in the microwave, a little extra care is enought to avoid the risk of injury. Buy your microwave safe water jug now! 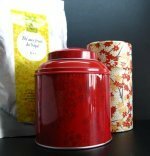 Using the microwave to heat water is fine if your aim is to reach its boiling point, but some types of tea require water heated at lower temperatures. This may be harder to achieve in the microwave and can be more easily controlled when using an electric tea kettle with temperature settings. Go ahead and read more about why electric tea kettles may be the best choice for you.